After finally cracking the quinoa code, this ancient seed became a family favorite. Although we love having the quinoa salad with corn and black beans it was time to try something new. I had bookmarked quite a few of my friend Saskia’s quinoa creations and this beauty was next on my list. But then the wonderfully talented Sally posted a cider-glazed carrot salad that she adapted from Bon appetit and I had all the ingredients on hand, and off to the kitchen I went. 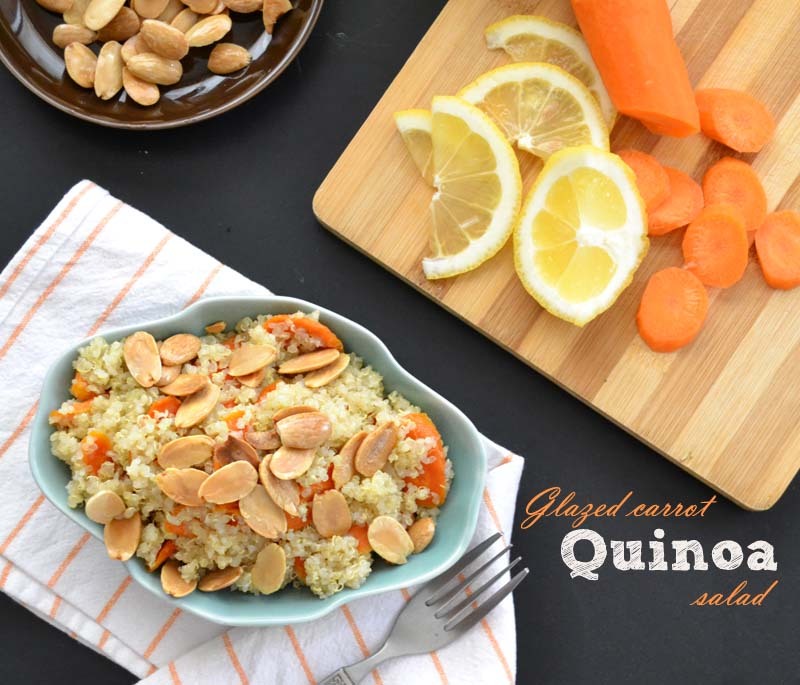 The salad was the perfect balance of sweet and sour, the glazed carrots added texture to the quinoa, the almonds added nuttiness and crunch while the parsley (which I added after taking the pictures)added color and a refreshing note to the salad. I served it with roasted chicken and it was a huge hit but you can also crumble some feta on top or enjoy it as is and it would make a wonderful vegetarian lunch. Sally added almonds to her salad and served it warm, the Bon appetit version had lettuce, onions and herbs. I stuck by Sally’s adaptation but doubled the glaze and brushed the carrots with it during roasting. Then after taking the pictures, I thought of adding a dose of freshness, so I added the chopped parsley and tossed it with the salad. Fluff with a fork and transfer to a large bowl; let cool. Meanwhile, line a baking sheet with parchment. Whisk cider and honey in a large bowl to blend; season with salt and pepper. Add carrots and toss to coat. Transfer to prepared baking sheet and roast until tender, 15-20 minutes. I brushed the carrots with the remaining honey cider mix every 5 minutes. Heat 2 tablespoon of olive oil in a small skillet. Add the almonds and cook over low heat until fragrant. Set aside, keeping it warm. To make the dressing: Whisk vinegar, lemon zest,and lemon juice in a small bowl. Gradually the olive oil, whisking until dressing is blended. Season with salt and pepper. You can prepare the quinoa, carrots, and vinaigrette the day before as long as you cover and chill them separately. Posted in Quinoa, Salad, vegan, Vegetarian and tagged basil plants, glazed carrots, mesh sieve, mint plants, Quinoa salad, refreshing salads, sweet and sour, vegetarian. Bookmark the permalink. loved the peek through your back window, what a nice touch, I should join that fun sometime in the near future… and of course, why am I not surprised you have such great hand with herbs and plants? 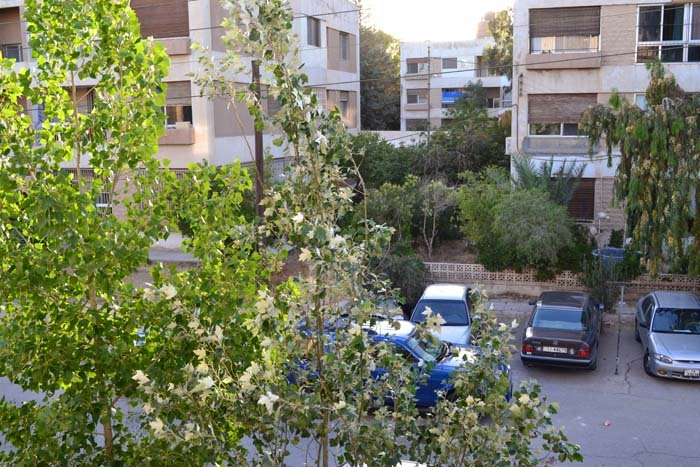 beautiful…..
Love your view and I can’t believe you have all those plants on your balcony, that’s amazing. It’s been rather an unpleasant spring here so I’m ultimately glad I decided not to plant tomatoes on the garage roof (sunniest place we have), but I’ll miss them. Yours looks like a beauty Sawsan. We love anything quinoa too and it’s fast become a staple in our home too. This recipe sounds intriguing with the cider glazed carrots, that’s very ingenius! I like anything served with quinoa and I really like carrots 🙂 Great recipe! i have yet to crack the quinoa code… the only way I’m able to use it is in granola. Your way of preparing it sure looks delicious! Beautiful dish and beautiful view. Thanks so much for the mention Sawsan! This salad looks like a winner. I absolutely overdosed on quinoa a few months ago, but I’m ready to dive back in again now. Have bookmarked this one to try. Sounds like a beautiful combination of ingredients. Love the glimpse of your balcony and your beautiful burgeoning herb garden! So great having herbs at hand. Your quinoa and glazed carrot salad looks delicious with an amazing viniagrette dressing. I love your healthy plant photos, you must have a huge window. The concept of sharing your outside view is unique and uplifting! Let’s face it: quinoa tastes great and is ‘good’ for us but is not the prettiest dish to serve up and photograph! Well, this is not only a wonderful new recipe for me [don’t eat nearly enough carrots and I love nuts!} but it is so appetizing i can see friends coming to dinner asking first and foremost ‘What IS that?’ 🙂 ! I’ve yet to “crack the quinoa code” myself, Sawsan, but this salad sure is tempting. 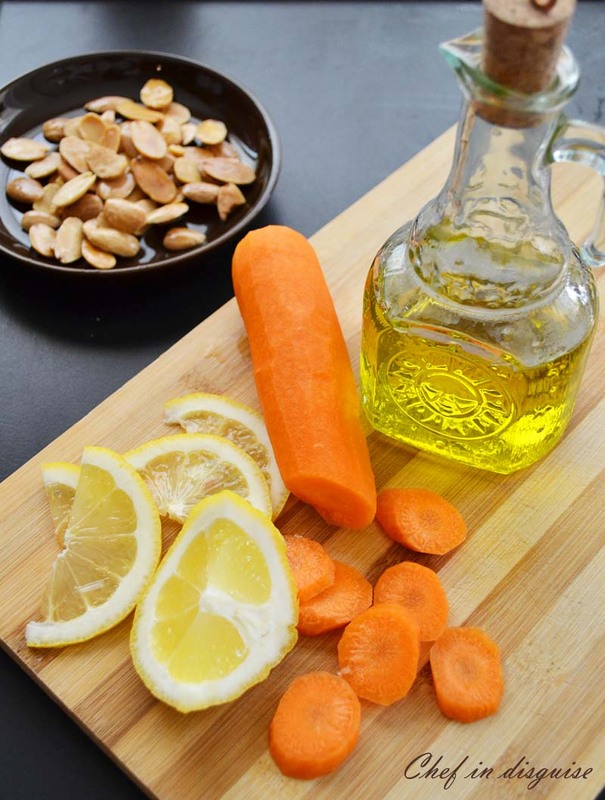 Those glazed carrots and slivered almonds really add some great flavors and textures to what must be a healthy salad. I did crack the quinoa code but I’m not using it in enough places I don’t think. Thanks for the glance out the window. I love taking a peek at not only the different landscapes but how alike we all are. This quinoa salad sounds like a winner, with summer around the corner (I hope, we are still having crazy yo-yoing weather) this is a timely recipe. Everything in your kitchen window garden is thriving. That first tomato is going to be the best tasting tomato one can ever have. I love this combination, reminds me of a North African carrot salad with quinoa. Fantastic! Quinoa is such a versatile grain. I love cooking with it. Your salad looks wonderful and the addition of the almonds must provide a marvelous flavor combination. I feel so spoiled with my big garden and am so impressed with the garden in your window! Thanks for sharing. Quinoa really does have great flavor, and is pretty easy to prepare. It’s so nice in summer salads – you can fit an entire meal into one dish! Lovely flavors in this – thanks so much. Hi Sawsan, I quite enjoy quinoa (not raw though… the flour from the raw grain has a bit of a funky taste) – and glazed carrots are lovely. I often serve them with sunday roast lunches, but a quinoa salad seems like a lovely, light way of serving them! The glazed carrots sound delicious against the quinoa. 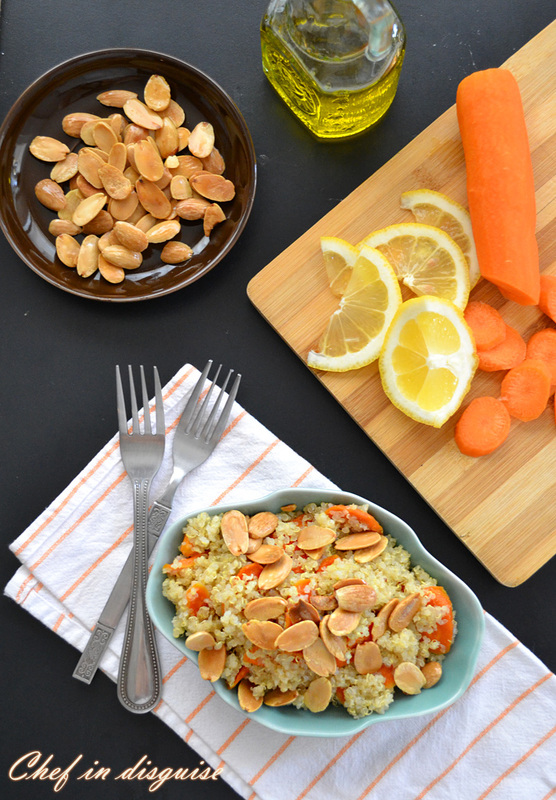 I really like the addition of the cider glazed carrots and nuts that you added to the quinoa. This is such a fun post…I love the idea of what’s in your backporch challenge. The salad is lovely. You have beautiful plants. Quinoa does a great job in salads! I add it to all salads lately to up the protein, especially since one of my daughters doesn’t eat meat. My husband would really love your cersion since he loves glazed carrots and almonds! They must add such a great texture to the quinoa. I love the sound of this salad – anything containing quinoa gets my vote!